The dhb Triple Lens Sunglasses are one of our best-selling products - and it's not hard to see why. They offer 100 per cent UVA and UVB protection and have a Hydrophobic lens coating to help repel sweat and water. State of the art UV absorbency give 100% UVA and UVB protection. Ultra scratch-resistant polycarbonate lens. Highly impact resistant. The Hydrophobic lens coating on all the lenses helps repels sweat and water. The Grey lens is ideal for bright sunny conditions. The Yellow lens provides a great multi-purpose tint that enhances shadows on overcast or flat light condtions. The sturdy yet lightweight wraparound style frame has stylish good looks and comes with three lens choices to suit all light conditions. They come with clear, grey and Yellow lenses and a soft padded case - unbeatable value. 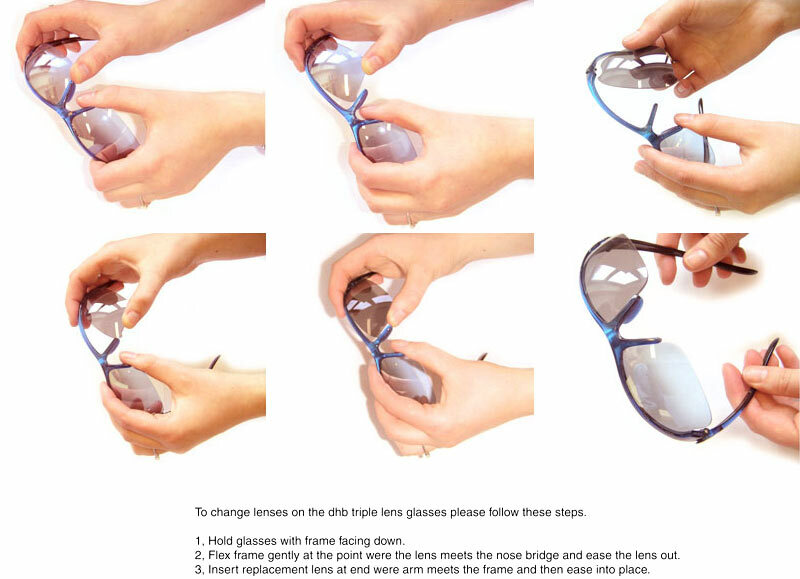 For instructions on how to change the lenses click here Please Note: These glasses come with a Clear, Grey and Yellow lenses not Clear, Grey and Blue as shown. I have been using these glasses for a while now and think they are brilliant. The combination of value and performance is just right. I've lost a couple of pairs out on the trails and have had no worries about replacing them due to the price. I use all three lens's depending on what time of the day I am out and about and also the weather conditions at the time, they protect my eyes in all situations. I've done the expensive shades thing and, ok you might think you look a bit cooler, but I'd rather spend the money I save on shiny bits for the bike! Superb performance and throwaway value. First thing I grab when I'm off cycling, apart from the bike! dhb Triple Lens Sunglasses is rated 4.1 out of 5 by 1467. Rated 5 out of 5 by RAL73 from Great value for money Great value for money and as a pair of glasses for low light and wet days they do the job. Not as comfortable as my Oakley M-frames but far cheaper than one spare blade and more versatile. Lens swapping takes a bit of getting used to but the lenses store well in the quality pouch provided. Rated 5 out of 5 by KG24 from Great set This was a gift for my husband, he is very happy with the glasses and finds them comfortable aswell as protective. I bought these glasses however no instructions on how to change the lenses?! You just need to pull the lens in a downward direction by the edge nearest the middle/your nose. The frame is very bendable even though you think you are going to break it. Replacement is just the reverse of removal. Do you sell just the frame ? I have these glasses but the frame snapped durning a crash so wish to buy the frame only. I have also managed to break the bridge on one pair and the arms on another through normal fatigue. Officially the components of these glasses are not available separately. However I have managed to fit these lenses to dhb UltraLite Sunglasses with little difficulty but the new frames probably won't be as robust. I have a 21.5inch head. Do you do the DHB refer a friend biking glasses in this size? On the add to basket section only smoke is available...is this just the frame colour? The 'smoke' despcription is the colour of the frame. As a female I find many of these glasses too big. Would you recommend a particular DHB pair? I would recommend the dhb Ladies Specific triple lens glasses as linked below. I got some for Christmas and don't want to start pulling too hard in the wrong way! Do the lenses from the glasses fit in any of your other dhb frames? Managed to snap the frame on my pair pair, and didnt want to purchase a whole new set, so was hoping the lenses would fit on the dhb lite sunglasses. Can a perscription be added to these lenses? This is not something that can be done with these glasses I am afraid. Can you get spare lenses for these glasses? I have some and scratched a lens, but otherwise they're fine. Sorry we do not sell the lenses seperately. Is it possible to purchase just the frames and one of these lenses? I bought the full set a while ago and have since lost the frames. Thanks. Unfortunately we do not stock these glasses as individual parts.